Federal, state and local officials have begun investigating whether Mitsui & Co's Intercontinental Terminals Co (ITC) met safety and environmental regulations after the fire in Deer Park, Texas, spread quickly among rows of giant tanks that hold up to 3.3 million gallons of fuel each. 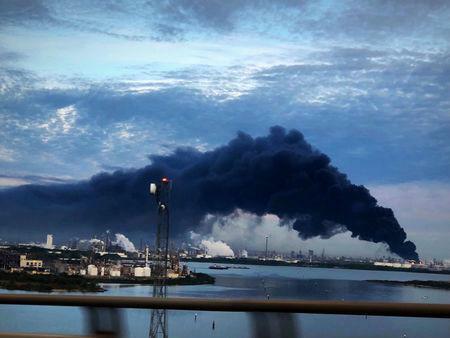 It burned for three days and destroyed 11 tanks holding fuels used to make gasoline and plastics that sat along the nation's busiest petrochemical port and among nine oil refineries. Results from those reviews could affect proposed terminals that would add millions of barrels of oil storage capacity, to cater to a shale boom that has made the United States the world's top oil producer with more than 12 million barrels pumped each day. Harris County, which oversees the ITC tank farm, plans to review the investigations and may propose changes to state regulations, said the county's chief executive, Lina Hidalgo. Environmental groups said the fire and lack of notice to residents exposed Texas's weak oversight of energy and chemical storage sites. "I would like to think there will be a huge push and elected officials would do their due diligence," said Elena Craft, senior director for climate and health at the Environmental Defense Fund. "We want accountability," said Bryan Parras, a spokesman for environmental group Sierra Club. The fire prevention group expects the investigations into the ITC fire could prompt changes to its guidelines, said Guy Colonna, NFPA's senior director of engineering. Its existing recommendation for petrochemical tanks, called NFPA 30, does not require fixed fire suppressants, Colonna said. State and local governments "need to amend the minimum requirements to hold companies like ITC more accountable for building terminals in areas where the severity of the fire is going to cause a bigger disaster," said Marcelo D'Amico, a principal at Orcus Fire and Risk Inc, which designs fire-prevention systems for tank farms. "The big fire was burning off the benzene," Sitton said. "If I start mandating things to put out fires, it could run the risk" of releasing more chemicals into the atmosphere.